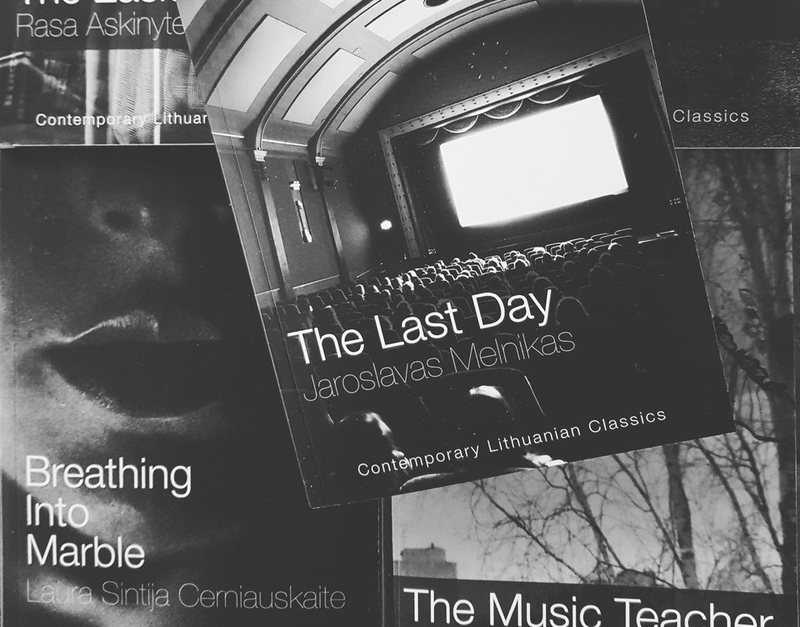 Deep Baltic has an extract from the story “The Grand Piano Room”, taken from the short story collection The Last Day, recently translated into English for the first time. Its author, Jaroslavas Melnikas (Yaroslav Melnik), was born in Ukraine and now lives in Vilnius. He speaks many languages, including Ukrainian, Russian, Lithuanian and French. I used to play the grand piano in my grand piano room. I only had to walk to the end of the corridor and open the door. There, on a specially decorated little table, lay a violin that my father would occasionally play. He would play when I wasn’t in there, which could be a little difficult (finding a moment when I wasn’t playing the piano, that is). If my father had suddenly felt like running his bow across the violin’s strings he wouldn’t have felt free to do so whenever he wanted. Clearly, it was a bit of an uncomfortable situation, even if it had only been once that he had approached the door and stopped, hearing the music flowing from beneath my fingers. I don’t think there’s any doubt that my father’s desire to play the violin would have been impeded by my presence in the room; he would have been a little bitter (perhaps not just a little) having hurried to the room, wanting to draw the bow across the strings of his violin, right then, immediately. Perhaps he would have felt then (for the first time?) that there was someone behind the door, filling his space. Fortunately, such a situation would have been rare; it couldn’t have happened more than once because my father hardly played the violin, while I only spent a couple of hours a week on the grand piano. All of this worry was just conjecture and hypothesising, thank God. Whenever I felt any kind of need, I always knew where I could go. I would play music in the grand piano room. Everything you might have needed was there and not a thing more. There was a music stand in the corner, a shelf of sheet music, and a bust of Beethoven on the grand piano. On the walls were portraits of composers. And another thing was the acoustics (the walls had been specially treated). There was a vase of flowers on the windowsill. I like emptiness. You would never find a hairbrush next to Beethoven, or a fork or some glue. The hairbrush was in a cabinet in the bathroom, the fork was in the dining room. The tube of glue was in the drawer of my desk, next to some pins, paper clips and other stationery items. In the same way, my painting was focused on my studio: the canvasses, the paint, the thinners, the gypsum models and the picture frames – everything that created my special world. This space had nothing to do with music, or with forks or hairbrushes and paper clips. And so what if I only went down to the studio (which was located in the warm basement) once a week, or even once a month? That wasn’t important. The important thing was that everything there had only one purpose, was dedicated to only one need. Everything was waiting for me. In a haze, I would finish a picture I had started some time before, having finally found the right solution. Then I would forget about the studio again for a while. I never thought about whether I was a professional or just an amateur: I simply painted. I needed to. Occasionally. So my life revolved slowly around these ‘rooms’. At my desk I wrote and thought, in the grand piano room I played the piano, in the studio I painted. I had my meals in the dining room, I washed in the bathroom and slept in the bedroom. In the sitting room, next to the fireplace, I watched TV. I relaxed in the snooker room. We don’t need to mention the obvious things like the toilet, with its light blue unit, the woodwork room (I used to like turning wood), and the gym (a sprung floor, a gymnastics wall, weights and other sports equipment). Somehow, it never occurred to me to think about how privileged I was to have all this. Was I a count? A duke? A millionaire’s son? Who was I? Was I dreaming? No, that was how I lived. That was the air I breathed. That was me; a different ‘me’ in each of the rooms. My parents, my wife and my children were exactly the same. My children had their own room, my wife had a dressing room with mirrors and cosmetics. We all lived very nicely. Even guests didn’t disrupt our spiritual harmony. They did nothing to spoil it, to tarnish that cleanliness, that mirror-sharp clarity (oh, how shiny our floors always were!). Our guests had their own rooms (they often stayed overnight). After dinner with our guests, I would calmly go off to one of my rooms (if I had no business in town that day, of course). And then I no longer felt their presence in our house. They never distracted me from myself, they always remained just guests. What I am going to tell you happened unexpectedly, and, most importantly, without any explanation. One morning, feeling the pull of the piano (I just needed to run my fingers across the cool, snow-white keys! ), I turned to go to the grand piano room only to find that there was no door at the end of the corridor. No door to the grand piano room! I’m one of those people who only believe in reality to an extent: not totally, as it were. Though nobody could say that I wasn’t a rational thinker. However, my reaction to the inexplicable becoming reality is not fast and is never hysterical. I look at something like that primarily as a phenomenon; though it’s not clear to me what has happened, it must have some inherent meaning. Because, for goodness sake, a whole room in the house can’t just disappear like that without a reason. So, as I was looking at that space on the wall I started to think, and it seemed to me that perhaps I should look at it from the opposite angle: what was strange was not the fact that the piano room had disappeared, but that it had ever actually existed. It was difficult though to establish the boundary between reality and appearance: was it not strange that there, on the smooth surface of the wall, there had once been a door? At least, it felt stranger to affirm that the door had existed, rather than say that it had never been there at all. However, feeling a little unnerved by such an odd and incomprehensible situation, I plucked up the courage (having decided to avoid hysteria) to talk to my family. It’s good that I am circumspect! She even stroked the smooth surface of the wall. I went down to the studio. My intuition whispered to me uncertainly: if it turned out that there was no piano room any more, could it be the same with the studio? I chased the thought away as I descended the stairs. The studio was where it had always been. Closing the door, I let out a sigh of relief. But I knew the piano room too well to believe that it had been a fiction. I recalled all the wonderful moments, the hours spent in the silence and emptiness of the room! I remembered its layout, the shelves for sheet music, the little decorated table for my father’s violin. I knew with certainty that Beethoven’s bust had stood upon the piano. I had no doubt; the piano room was a reality. But if there was no sign left on the wall where the door had been, if my wife had never heard about it, perhaps it was some other reality. The strangest thing was that I remembered my wife coming into the room occasionally. Perhaps that too had been a different reality. And my wife, Lucy, perhaps she was somebody else then? At least I wasn’t silly enough to start blundering in on such a sensitive issue. Having recovered somewhat, I suddenly noticed my grand piano in the corner of the studio where I had used to keep a pile of canvases; it was the same brand, with the same scratch on its leg. There could be no doubt it was the same piano, the one from the grand piano room. And on it, in the very same place, stood the Beethoven bust. On Monday 2nd July, Noir Press will hold a launch for the short story collection, including readings from the book and a discussion, at the Ukrainian Institute in London. More details here.